The past few weeks I have been entirely wrapped up in some lingering challenges from chemo. Without getting into too much detail, I'll just say that it has made our struggles with fertility that much more difficult. And at this point in my life, it often feels as though every one I know (or sit next to, or stand behind, or order my juice from) is pregnant. While I am very happy for my friends (especially those who have struggled right alongside me), I can't help but feel disappointed and discouraged by my body's seemingly uncooperative attitude. It's easy to feel guilt and blame - just lop it onto the ever-growing mountain that I've saddled myself with since cancer changed things so. Even though logically, I know that I didn't do anything to cause my lymphoma, and I've done everything within my financial and gastronomical power to improve our chances at conception, the feelings are hard to shake. Bouncing back and forth from living in the moment, enjoying watching my boy blossom, read, sing, smile, and then fighting the desire to crumple into a ball under the fear of the uncertain future. The heart of the matter is that in treating my cancer, I rightly chose to preserve my own life. In doing so, I may have lost the ability to create another one. This is not a choice I should have had to make. Okay, okay. I'm working through the angry, the bitter, and the sad of what chemo did. Dan and I have every intention of building our family, through whatever means necessary. I am enormously blessed with a loving husband, a healthy child, doting parents close by, a home, fresh food, supportive family, quality friends, health insurance, a part time job, and a few pairs of shoes I even like (there's more but I don't want to rub it in). Meditation is helping me to make peace with whatever will be, helping me to loosen my grip on Plan A (as if we were still on Plan A). And today, to help me regain my perspective, I had my six month CT scan. Dr. Herbert, wonderful, caring, human Dr. Herbert called me approximately 15 minutes after I had dropped off the disk at his department to give me his caveat-filled take on the images: looks good. We all have this blissful illusion of control. We imagine that we will reap what we sow, hard work will be rewarded, etc. Until reality sets in and that delicious, comforting feeling of power (we thought we had) is suddenly in pieces on the floor. Sometimes, it takes a big meatball (seitan?) to open our eyes to the randomness of life. Tonight, when I posted my preliminary good news on Facebook (which, by the way, I've been trying to largely stay away from in order to stay sane), the feedback was so gratifying. Thinking back to 2 years, 8 months, and 25 days ago (diagnosis day), I did not foresee the future. I was not time traveling, future projecting, or kicking myself for past mistakes. All I focused on was every minute as it came (and not vomiting). And I know now that I couldn't have possibly gotten through the past 2 years, 8 months and 25 days without all of the formidable support of my team. I've written before about luck - and I've got a feeling I'll still be warming to the idea for years to come. Today I am relieved that I got lucky, for along with the bitterness, chemo left some joy behind as well. 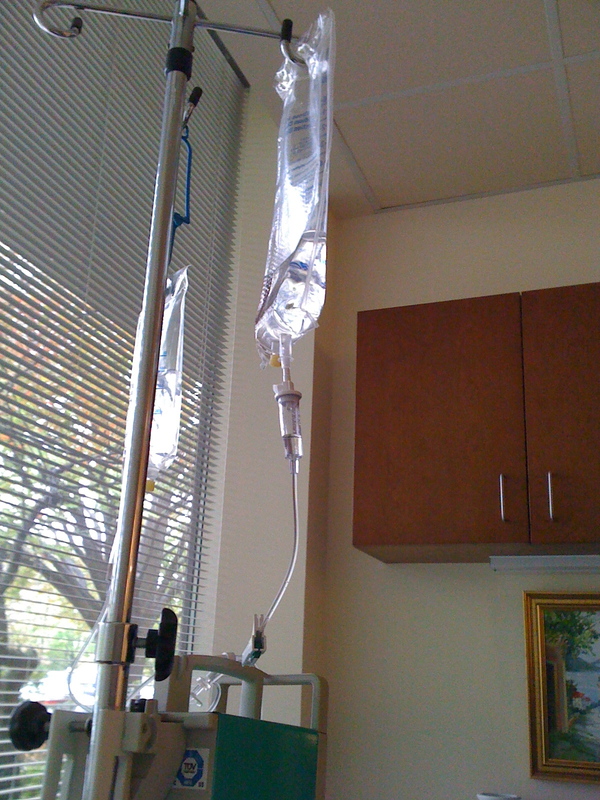 I was lucky that my cells were ripe to the rituxan (R), cytoxan (C), adriamycin (H), vincristine (O), prednisone (P) + death ray machine my doctors threw at them, and that the support I reached out for is still very much with me. I learned a great deal over the past few years - particularly how very much we need each other, and that's amongst the few certainties in life. Big gracious love to you for reading, "liking", commenting, messaging, calling, texting, emailing, old fashioned letter writing, and reminding me you are there. Those reminders are essential to staying focused on what IS (instead of what ISN'T). Mia, you are amazing. Thank you for sharing your story with us as it unfolds. 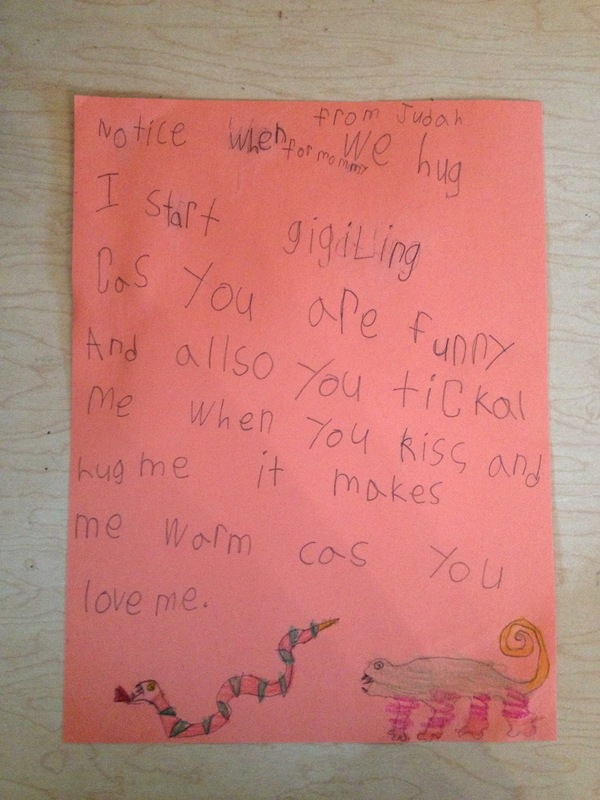 OMG, Judah's letter. How awesome is that kid? I don't know you, but I am friends with your Aunt. Let me just say that I had lymphoma 13 years ago and am doing just fine (other than getting older rather quickly). Those days of chemo, radiation etc were certainly no fun, but now they seem like a distant memory. Do I have a suggestion? Yea, just be happy with what you do have - enjoy your marriage and family, watch your son grow up, and be thankful that you have another chance at life. I always felt I was living on borrowed time, so certainly take advantage of it. Good luck. Another amazing post that's book-ready for your proposal.Did someone dictate that letter to Judah? Yikes. 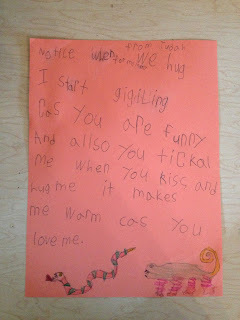 A poet in kindergarten. Imagine first grade. Blair lives his words-- as for aging, it's not a word that comes to mind.